I went with Lynette and Monica (of Passion Knit) to the Midwest Fiber and Folk Art Fair last weekend. It was my first time there, and I was very impressed. There were some great vendors with gorgeous yarn and other fiber accessories. I'm on a budget now, so I was very frugal and didn't get much. However, The Fold in Marengo, IL, had a booth there, and all their Blue Moon Fibers yarn was 25% off, so I got a skein of Slinky, a cotton, nylon, and polyamide ribbon yarn. I'm using it to make yet another scarf. 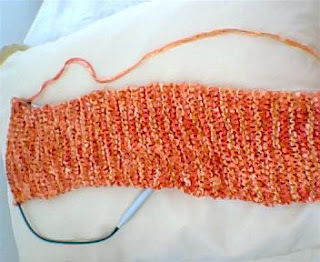 It's just plain garter stitch, but when I'm done, I plan to drop a few stitches at random to make a ladder stripe pattern. 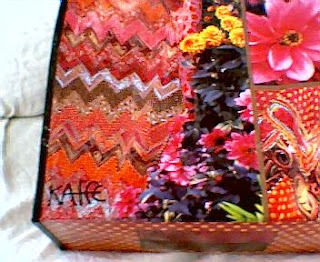 One of the vendors was selling these awesome Kaffe Fasset-patterned recyclable shopping bags. I resisted at first, but when I saw that it has interior pockets and a velcro closure, I was sold. It came in very handy when I went to the Daley Plaza farmers market this morning. Be on the lookout for this bag. All the cool kids have 'em. boy you are speedy! already speeding through your yarn from the fest. It was good to see you! I wish I had gotten that bag..but I have too many, etc. etc. your scarf looks good. i'm searching Ravelry for a cool pattern using my goodies too.